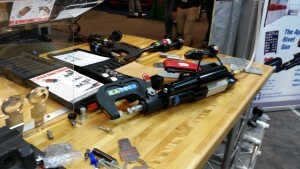 Some Missouri high schoolers might be better equipped to rivet some of the hottest new mixed-materials cars than some professional auto body technicians following Kennett Career and Technology Center’s win of a $10,900 rivet gun at SEMA. 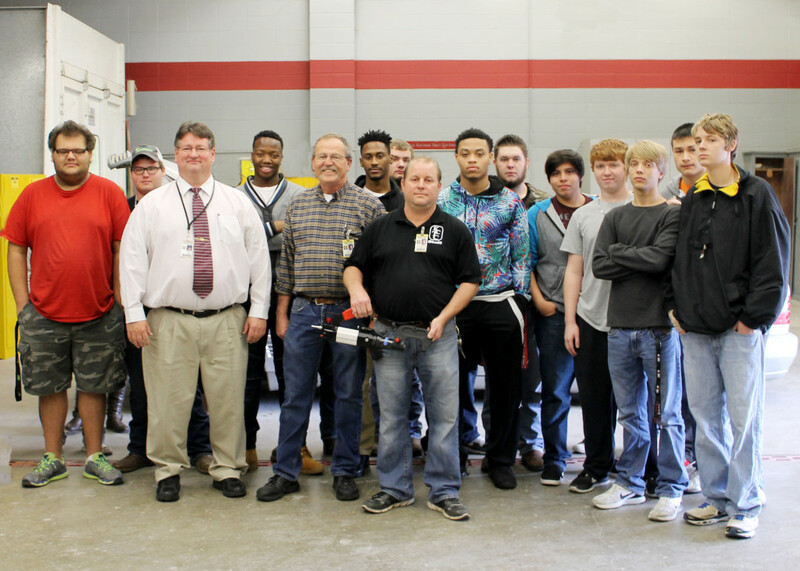 KCTC auto technology instructor Michael Rhew won the Society of Collision Repair Specialists’ XPress 800 giveaway Nov. 6, drawing approval from tool donor Reliable Automotive Equipment. “It’s going to a career center. … It’s a dream,” RAE President Dave Gruskos said after the drawing with SCRS Executive Director Aaron Schulenburg. The Wielander+Schill tool carries OEM-approved adaptors for work on Mercedes and Tesla vehicle as well as being the only gun so far approved for the Cadillac CT6. Rhew, Kennett Career and Technology Center auto collision repair instructor Kenneth McKinney and campus Director Terry Bruce attended the 2015 SEMA, according to the Daily Dunklin Democrat’s Dec. 5 coverage. “I had told Mr. McKinney that if I won that rivet gun, he would owe me an unlimited amount of favors,” Rhew told the Democrat with a laugh. Rhew donated the gun to the school, the newspaper reported. Rhew said in an interview Wednesday the school had never won anything of that magnitude. “I’m just tickled to death,” he said. The school draws students from seven other local schools and also trains post-secondary and adult students. Rhew estimated McKinney’s auto collision course had about 21 juniors and seniors, while his own had about 27 upperclassmen. About 30 percent of graduates in each program stay in that field, he said. The Southern Missouri “bootheel”-area school is small, and more than 73 percent of the entire Kennett district’s students are on the free or reduced-lunch program, Missouri Department of Education statistics indicate. “We would never be able to afford this piece of equipment,” Rhew said. The school right now isn’t working on any mixed-materials vehicles, Rhew said, but given the rush towards lighter, safer cars by OEMs, such tech will likely continue to advance into the mainstream. It’s the third year the tech school has put in an appearance at SEMA, according to the Democrat. “We want to keep an enthusiasm for those teaching in the field and with this event, they come back excited,” Bruce told the newspaper. KCTC also received a free copy of an Identifix auto repair estimating service for Rhew’s class at SEMA, saving $1,100 a year, according to Rhew and the Democrat.